Ware visited with the Jets on Wednesday, Rich Cimini of ESPN.com reports. Analysis: Ware had previously met with the Lions and Colts earlier in the offseason. While none of these three teams can offer anything more than a complementary role, Ware has one campaign (2016) with 1,368 yards from scrimmage on his resume, proving his worth as a runner and pass catcher. On the other side of the coin, he spent the entire 2017 season rehabbing from PCL and LCL tears in his right knee. Ware worked out for the Colts on Tuesday, Aaron Wilson of the Houston Chronicle reports. Ware is visiting with the Lions on Monday, Adam Schefter of ESPN reports. Analysis: With Le'Veon Bell, Mark Ingram, Tevin Coleman, Latavius Murray and Adrian Peterson all off the market, Ware is one of the better backfield options still available. Detroit can offer him an opportunity to compete with Zach Zenner for the No. 2 runner role, a job that may include goal-line and short-yardage carries. Ware played 10 of the Chiefs' 52 offensive snaps Sunday in the 37-31 overtime loss to the Patriots in the AFC Championship Game. He logged no carries and took his lone target for 21 yards. Ware (hamstring) is active for Sunday's AFC Championship Game against the Patriots, BJ Kissel of the Chiefs' official site reports. Analysis: Available to the Chiefs offense for the first time since Dec. 9, Ware's presence makes for a cluttered backfield. He likely will serve in a complementary role to Damien Williams, who has averaged 101.2 yards from scrimmage per game and scored seven touchdowns over the last five contests. Over the course of his career, Ware boasts an average of 4.6 yards per carry and has hauled in 59 of his 71 targets (83.1 percent), a skill set that may be put to use versus New England's 21st-ranked defense. Ware (hamstring) does not carry an injury designation for Sunday's AFC Championship Game against the Patriots. Analysis: Ware, who last suited up Dec. 9, thus is available this weekend, but he figures to work in a complementary role behind Damien Williams, whose strong play in Ware's absence has earned him top billing in the Chiefs' ground game at this stage of the team's campaign. Ware (hamstring) practiced fully Thursday. Analysis: We'll have to see if Ware graduating to full practice participation after being limited Wednesday leads to him heading into Sunday's AFC Championship Game against the Patriots minus an injury designation, but even if he does suit up this weekend, we'd expect the running back to work in a complementary role behind Damien Williams, whose recent strong play has earned him top billing in the Kansas City backfield. Ware (hamstring) practiced in a limited fashion Wednesday. Analysis: Ware logged limited practices last week as well before sitting out Saturday's divisional-round win over the Colts. Even if Ware is made active for this weekend's AFC Championship Game against the Patriots, he would likely work in a complementary role. Damien Williams has thrived since taking over lead duties out of the Kansas City backfield in Week 15 and shouldn't be in line for a major reduction in touches if Ware suits up. Ware (hamstring) is listed as inactive Saturday against the Colts, James Palmer of NFL Network reports. Analysis: A limited practice participant during divisional-round prep, Ware did not emerge favorably from a pregame warmup and thus will miss a fourth consecutive contest. Expect Damien Williams to earn the bulk of the backfield work, which translated to 322 yards from scrimmage and four touchdowns during Ware's first three absences. Further down the depth chart, Darrel Williams and Charcandrick West are on hand to spell the other Williams. Ware (hamstring) is expected to work out pre-game to determine his availability for Saturday's divisional-round game against the Colts, but expectations are not high regarding his game-time status, Adam Schefter of ESPN reports. Ware (hamstring) is listed as questionable for Saturday's playoff game against the Colts after practicing in a limited fashion this week. Analysis: Ware hasn't played since Week 13, but he appears poised to return to action Saturday, aided by the extra healing time he was afforded by the Chiefs' first-round bye. In the event that he does face the Colts this weekend, Ware would re-enter the backfield mix as part of a time-share that could well favor Damien Williams, who filled in capably during Ware's absence. Ware (hamstring) remained limited at practice Wednesday. Analysis: Ware last suited up Dec. 9, but back-to-back limited practices following Kansas City's first-round playoff bye put him in a position to return to action Saturday against the Colts. In such a scenario, it's expected that Ware would re-enter the backfield mix as part of a timeshare with Damien Williams, who filled in capably during Ware's three-game absence to close the Chiefs' regular-season slate. Ware (hamstring) was listed as limited on Tuesday's practice report, BJ Kissel of the Chiefs' official site reports. Ware (hamstring) is participating in the open portion of Tuesday's practice, Pete Sweeney of ArrowheadPride.com reports. Ware (hamstring) is inactive for Sunday's game against the Raiders, BJ Kissel of the Chiefs' official site reports. Analysis: With Ware still out, Damien Williams is in line to head the Kansas City backfield in Week 17, while rookie Darrel Williams and Charcandrick West are set to work in complementary roles. Ware (hamstring) is listed as questionable for Sunday's game against the Raiders after practicing fully this week. Analysis: Despite the questionable tag, we'd expect Ware to suit up Sunday and rejoin a backfield that also includes Damien Williams, who turned in two consecutive productive outings while Ware missed time. A Week 17 backfield timeshare would seem to be in the cards for the Chiefs' regular-season finale, but there could be an opportunity for both Ware and Williams to thrive. The Raiders have allowed 143.3 rushing yards per game this season, with only the Dolphins and Cardinals surrendering more. Ware (hamstring) practiced fully Wednesday. Ware (hamstring) is inactive for Sunday's game against the Seahawks, BJ Kissel of the Chiefs' official site reports. Analysis: With Ware still out, Damien Williams is in line to head the Kansas City backfield in Week 16, while rookie Darrel Williams is slated to serve as his top complement. Charcandrick West is also on hand in a reserve capacity. Ware (hamstring) is listed as doubtful for Sunday's game against the Seahawks. Analysis: Ware practiced in a limited fashion Wednesday through Friday, but it looks like the Chiefs are inclined to play it safe with their top back for another week to ensure he's in optimal shape for the postseason. Assuming Ware misses a second straight game this weekend, Damien Williams would be in line to head the Kansas City backfield, with rookie Darrel Williams serving as the top complement. Ware (hamstring) remained limited at practice Thursday. Analysis: Ware is trending in the right direction as Sunday's game against the Seahawks approaches, but given that the contest kicks off at 8:20 PM ET, ideally the running back would head into the weekend minus a Week 16 injury designation. If Ware ends up returning to action, the snap counts and workloads of both Damien Williams and Darrel Williams would presumably take a hit. Ware (hamstring) was limited at practice Wednesday. Analysis: That's a step in the right direction for Ware, who was inactive for last Thursday's comeback win over the Chargers. His ability to practice for the Chiefs' first session of Week 16 bodes well for his chances of suiting up this weekend against the Seahawks, in the absence of any setbacks. If that comes to fruition, Ware could start and cut into the respective snap counts of Damien Williams and Darrel Williams, both of whom were productive as the main backfield options in Week 15. Ware (hamstring) is expected to participate in Wednesday's practice in some fashion, BJ Kissel of the Chiefs' official site reports. Analysis: The extent of Ware's activity won't be known until the Chiefs release their first Week 16 injury report later Wednesday, but the running back appears to be trending in a positive direction as Sunday's game against the Seahawks approaches. However, in the event that Ware remains out for a second straight game or is limited at all this weekend, Damien Williams and Darrel Williams would once again be in line for added opportunities in the Kansas City backfield. Coach Andy Reid said Ware is making progress in his recovery from a minor hamstring injury, Brooke Pryor of the Kansas City Star reports. "[Ware]'s making progress with his hamstring," Reid said Monday. "That was the primary thing. He tweaked it. It's not a severe hamstring, but it was just enough he couldn't open up for the game. We'll just have to see on that. Day-to-day." Ware (hamstring) is inactive for Thursday night's game against the Chargers, BJ Kissel of the Chiefs' official site reports. Analysis: With Ware -- who had been listed as doubtful -- officially out, Damien Williams profiles as the team's top back Week 15, which gives him a degree of short-term fantasy utility for those in need of backfield help. Also on hand to work in complementary roles Thursday night are Darrel Williams and Charcandrick West. Ware (hamstring) is listed as doubtful for Thursday's game against the Chargers, BJ Kissel of the Chiefs' official site reports. Analysis: Unable to practice in any capacity this week, Ware is expected to miss at least one game, leaving Damien Williams as the likely leader of the Kansas City backfield. 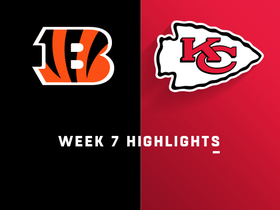 Darrel Williams and Charcandrick West may also have Week 15 roles, while Ware probably needs to shift his attention to getting ready for a Week 16 game in Seattle. Ware (hamstring) won't participate in Tuesday's practice, Brooke Pryor of The Kansas City Star reports. Analysis: The Chiefs had previously listed Ware as a non-participant on Monday's practice report, but that was merely an estimation of his activity with the team staging a walkthrough. Tuesday's session will appear to be a more traditional practice, so Ware not being on the field in any capacity is not a great sign. He'll probably need to fit in some activity Wednesday to have a realistic shot at playing Thursday against the Chargers. Ware was listed as a non-participant on Monday's practice report with shoulder and hamstring injuries. Ware (hamstring) carried 15 times for 75 yards and caught all five of his targets for 54 yards in Sunday's 27-24 win over the Ravens. Analysis: Ware did leave the game for a spell due to a shoulder issue, plus he tweaked his hamstring, Brooke Pryor of The Kansas City Star relays via coach Andy Reid. As a result, it will be worth tracking the running back's status as Thursday's Week 15 game against the Chargers approaches. If Ware is hampered at all in the coming days, added backfield opportunities would be available for Damien Williams. Ware was able to return to Sunday's game against the Ravens after exiting the contest due to a shoulder issue. Analysis: With Ware back in to the lead the Chiefs' Week 14 rushing attack, Damien Williams will revert back to his complementary duties in the team's backfield. Ware was forced out Sunday's game against the Ravens with a shoulder injury. Analysis: Ware logged eight carries for 32 yards and three catches for 45 yards prior to his exit. In his absence, Damien Williams will lead the Chiefs' ground game. Ware carried 14 times for 47 yards and a touchdown and caught one pass for five yards in Sunday's 40-33 win over the Raiders. Analysis: Ware drew his first start of the season Sunday, following the release of Kareem Hunt. Prior to Week 13, Ware had logged 22 carries for 124 yards and a TD and added 11 catches for 165 yards in 11 contests. He's now in line to head the Kansas City backfield moving forward, with Damien Williams on hand to work in a complementary role and Darrel Williams in reserve, but the Chiefs are expected to audition at least two veteran tailbacks for depth in the coming days. Ware is slated to serve as Kansas City's featured back Sunday against the Raiders, Adam Teicher of ESPN.com reports. 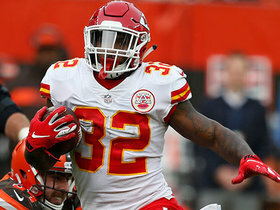 Analysis: With Ware set to lead the team's Week 13 backfield, Damien Williams and Darrel Williams are on hand to serve in reserve/complementary roles following the release of Kareem Hunt. 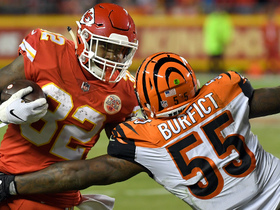 Ware is in line to start at running back for the Chiefs on Sunday against the Raiders, Adam Teicher of ESPN.com reports. Analysis: With Kareem Hunt no longer on the roster, Ware is now listed atop the backfield depth chart. He'll be backed up by Damien Williams and Darrel Williams on Sunday and will presumably serve as the Chiefs' featured back for the rest of the season. Ware saw the field for just 11 offensive snaps (15 percent) Monday against the Rams and didn't record a stat. Analysis: Just a week after he scored his first touchdown of the season, Ware was basically invisible Monday night. Ware has yet to see more than 24 offensive snaps this season, and there's no reason to believe that will rise much as long as starting running back Kareem Hunt remains healthy. Ware rushed twice for six yards and a touchdown and caught his only target for seven yards Sunday against the Cardinals. Analysis: Ware played 20 or more offensive snaps for just the third time all season in Week 10, turning the extended run into his first touchdown of the campaign. He remains the top backup option behind Kareem Hunt, but a distant No. 2 option at that. Ware rushed twice for 12 yards and caught four passes for 69 yards Sunday against the Browns. Analysis: A week after being held out of the box score completely, Ware fell just short of a season-high mark for all-purpose yards. His reps will likely remain extremely limited as long as Kareem Hunt is available, but Ware remains the clear direct backup should Hunt miss time. Ware played just nine offensive snaps and didn't have single touch Sunday against the Browns. Analysis: After being expected to contribute in some meaningful fashion this season, Ware's offensive role has been spotty at best. He remains the top backup option should Kareem Hunt be unavailable, but Ware possesses little value as a backup. Ware notched 59 rushing yards on eight carries and caught three passes for 30 yards Sunday against the Bengals. 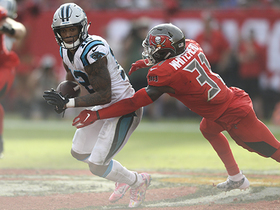 Analysis: Ware saw his largest workload of the season in Sunday's affair and took advantage with a 34-yard scamper to boost his average to 7.4 yards per carry. Until it's proven that Ware will regularly be involved in the offensive game plan, he can be left on the waiver wire in many leagues. Ware totaled two carries for five yards and two catches on three targets for nine yards Sunday night despite playing just 16 snaps against the Patriots. Analysis: Kareem Hunt once against starred for the Chiefs against the Patriots, racking up 185 all-purpose yards and a touchdown. Ware is unlikely to see much action while Hunt remains healthy, but he remains the direct backup should Hunt be sidelined. Ware rushed once for no gain and caught one pass for 13 yards Sunday against the Jaguars. Analysis: Ware owns just four total touches in the last two weeks, suggesting the team has decided to ride Kareem Hunt out of the backfield. He remains the direct backup in the event Hunt is unavailable. Ware rushed just twice for six yards Monday against the Broncos. Analysis: Despite being the No. 2 back this season, Ware has not carried the rock more than three times in a game through four weeks. He remains the direct backup to Kareem Hunt but is nothing more than a handcuff option in the vast majority of leagues at this point. Ware rushed just once for one yard and caught two passes on three targets for 29 yards Sunday against the 49ers. Analysis: Ware took the field for 24 percent of the Chiefs' offensive snaps Saturday, but he didn't manage to turn that into much in terms of production. Still, the 26-year-old back remains the direct backup to Kareem Hunt and would likely receive the bulk of the carries should Hunt be unavailable at some point. Ware (knee) is active Sunday against San Francisco, BJ Kissel of the Chiefs' official site reports. Analysis: Ware popped up on the injury report Friday after logging a limited practice due to a knee injury, but he'll suit up nonetheless in advance of what should be a backup role. He should see limited offensive snaps in relief of starter Kareem Hunt, in addition to Ware's regular modest role on special teams. Ware is listed as questionable for Sunday's game against the 49ers after logging a limited practice Friday. Analysis: Ware was added to the injury report Friday, so his status will be worth monitoring in advance of Sunday's 1:00 PM ET kickoff. 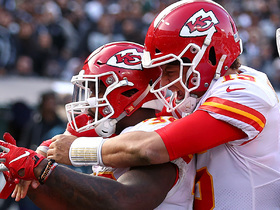 In any case, Ware's fantasy value remains modest as long as top back Kareem Hunt stays healthy and continues to handle the bulk of the Chiefs' carries. Ware carried the ball once for a three-yard gain during Sunday's 42-37 win over the Steelers. Ware had three carries for 32 yards and caught his lone target for eight yards in Sunday's 38-28 win over the Chargers. Analysis: All four of Ware's touches came in the first half, either on third down or while the Chiefs were running their no-huddle offense before halftime. Meanwhile, Kareem Hunt was held in check, rushing for 49 yards on 16 carries. After suffering a torn PCL and LCL last season, Ware looks healthy, but isn't likely to see a lot of work unless something happens to Hunt. 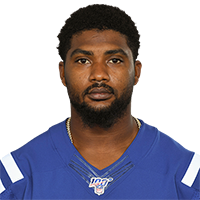 Ware (knee) toted the rock three times for three yards and caught one pass on two targets for one yard in Saturday's preseason game against the Bears. Analysis: Ware figures to slot in as Kareem Hunt's top backup for the Chiefs this season, but is still getting his feet wet in terms of live action, with Saturday's game marking his first since he suffered a torn PCL and LCL last season. There's a decent chance he will see some more work in the preseason finale with the starters slated to sit out the contest. Ware (knee) is scheduled to play in Saturday's preseason game against Chicago, Matt McMullen of the Chiefs' official websit reports. "There's a chance [Ware plays]. I'm going to see how he does during the warmups, but right now, he's scheduled to play," Chiefs coach Andy Reid said Thursday. "We'll just see how he feels - especially after today." Ware (knee) didn't play in Friday's preseason game against Atlanta. Analysis: Ware has ramped up his participation throughout training camp, including contact work and 11-on-11 drills this past week. He seems to be on track for at least one appearance this preseason, but it didn't happen Friday night. Ware may still have a chance to start the season as Kansas City's No. 2 running back, hoping to beat out Damien Williams, Charcandrick West and Kerwynn Williams. Ware (knee) did contact work at Monday's practice, Lynn Worthy of The Kansas City Star reports. Analysis: Ware must have avoided any setbacks Sunday when he made his first appearance of the year in 11-on-11 drills. Friday's preseason game against Atlanta would probably be pushing it, but the sixth-year pro might have a shot to play in the third or fourth week of the preseason. Assuming he looks something like his old self, Ware should have the advantage over Damien Williams (shoulder) and Charcandrick West in a competition for backup work behind Kareem Hunt. Ware (knee) participated in 11-on-11 drills during Sunday's practice, Brooke Pryor of the Kansas City Star reports. Ware will not dress for the Chiefs' preseason opener Thursday against the Texans, Adam Teicher of ESPN.com reports. Analysis: Ware is being eased back to a full workload following PCL and LCL tears suffered last August, so it's not a major surprise that the Chiefs' brass will hold the tailback out of the team's preseason opener. It wouldn't be surprising if he makes an appearance in either Week 2 or 3 of the preseason to get some live action for the first time since he suffered the injury, but assuming he's healthy when the regular season rolls around the fourth-year back seems the top candidate to spell Kareem Hunt. Ware (knee) agreed to restructure his contract, converting half of his $1.45 million base salary into incentives, Field Yates of ESPN reports. Ware (knee) is being brought along slowly at training camp, BJ Kissel of the Chiefs' official site reports. Ware (knee) was limited to individual drills Tuesday, the Chiefs' official site reports. Ware (knee) did not participate in Thursday's OTA session, Pete Sweeney of 610 Sports Radio reports. Analysis: Ware is expected to assist in diversifying Kareem Hunt's workload this season, but coach Andy Reid indicated in mid-April that he's unsure exactly when he will be ready to retake the field. The Chiefs bolstered the running back position this offseason with the signings of Damien Williams (shoulder), Charcandrick West and Darrel Williams, but Ware could emerge as the No. 2 back if he proves healthy in training camp. While he still expects Ware (knee) to return for the upcoming season, Chiefs coach Andy Reid acknowledged Monday that he isn't 100 percent sure about the running back's availability, Terez A. Paylor of The Kansas City Star reports. Chiefs coach Andy Reid expects Ware (knee) to return from injury and help diversify Kareem Hunt's workload, Terez A. Paylor of the Kansas City Star reports. 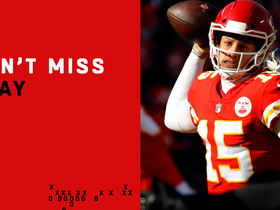 Kansas City Chiefs quarterback Patrick Mahomes makes an incredible throw to running back Spence Ware for a big gain. 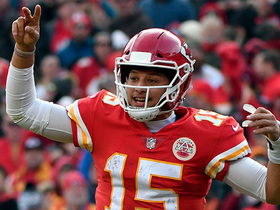 Kansas City Chiefs quarterback Patrick Mahomes throws ill-advised interception. Kansas City Chiefs running back Spencer Ware powers over the goal line for the touchdown vs. the Oakland Raiders. 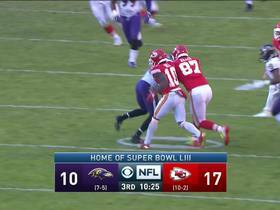 Kansas City Chiefs running back Spencer Ware plays fullback for power touchdown run. Kansas City Chiefs running back Spencer Ware's one-handed tip catch turns into a 21-yard gain. 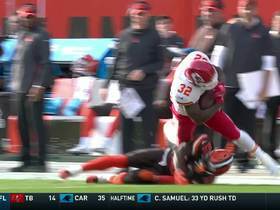 Kansas City Chiefs running back Spencer Ware nearly goes the distance on a 35-yard run.